I’ve entered a contest run by Cherie and Chris of Technomadia, where they’ve asked travellers (like me!) to write about how serendipity has influenced our lives. If you want to know why I’ve written SerenDIPity like that, check out this post about the contest. If you’re already here via Technomadia, welcome! I left England for Thailand, intending to spend three months volunteering in an animal clinic. 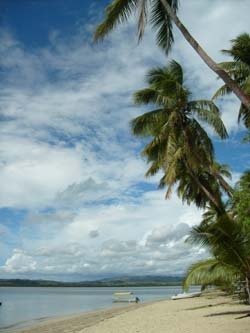 I had visions of a tiny paradise island – and I was dead right! Koh Phangan had everything I could have asked for – postcard-perfect beaches, dense tropical jungle and a party scene so wild I very nearly didn’t survive it. It was so good, I couldn’t even think about going home. Actually I missed my flight. It was accidentally-on-purpose. I’d sort of seen it coming; I hadn’t bothered to check my ticket for a long time, and I wasn’t exactly devastated to find the flight had left without me. I just climbed back into my hammock and appreciated one more fiery sunset over the ocean. I ended up staying for nearly a year. I had no desire to go back to England at all – I was taking people Scuba-diving for a living, still working at the animal clinic in-between times and still loving life on that tiny tropical island. Every day was different; whether guiding customers through shoals of brightly coloured fish, nursing stray dogs back to health at the clinic, or rescuing irate monkeys from places they really shouldn’t be (like restaurants); as far as I was concerned, my life there was perfect. Eventually though, I began to run out of money; I’d spent everything I could, then borrowed more and spent that too. My diving wages had all gone on dive gear and I was fighting the realisation that my trip was nearly over. The final blow was when a thief broke into my bungalow and stole the last of my cash. I was getting desperate. Being suddenly penniless 6,000 miles from home, in a country where no-one in authority speaks your language, is pretty scary. Home would be boring – it would certainly mean the end of my adventures – but it would be safe. Then I got a phone call from my sister. She was on holiday in Australia, staying with a friend she’d met whilst traveling, and the two of them were planning a grand trip around the country. She’d called to see if she could convince me to leave Thailand, fly to Australia, and come with them! I said I’d have loved to, if only I could afford it. “No worries!” she said. Her friend Krista had a place I could stay while I looked for work. It all seemed likely to end in tears – my sister and I have had a volatile relationship in the past, and being dependant entirely on her friend’s charity would be the total opposite of the freedom I’d become accustomed to. Plus there was paperwork, and visas, and… that ever-present fear of the unknown. But sometimes you’ve just got to go for it. Trust to fate, I thought. I flew into Perth on a maxed out credit card, arriving with nothing but the clothes on my back – the animals had destroyed the rest! My entire luggage allowance was taken up by one huge bag of diving gear. I couldn’t even afford a cup of coffee in the airport. But then, who can these days? 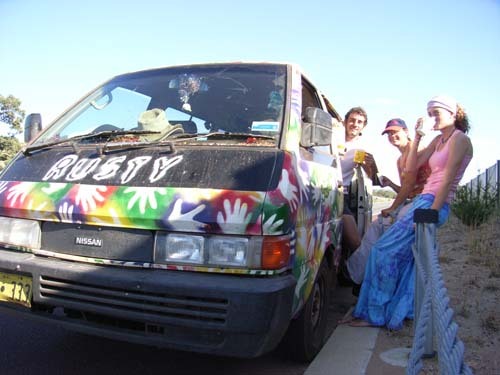 Gill and Krista came to pick me up in a crumbling van they’d bought and decorated with multi-coloured hand prints! Appropriately enough, they’d called it ‘Rusty’. Krista had set up an interview for me with a local job agency for the following day. I started work the day after that. She drove me in to work herself, and picked me up afterwards, every day for the couple of weeks it took me to get back on my feet. Sometimes she’d even bring me cookies or cake! I had so much fun hanging out with her, I decided to risk joining the grand adventure after all; as soon as I had a bit of cash saved up we all piled into ‘Rusty’ and set off for parts unknown. Six years later, Krista and I are still travelling. In that time we’ve hardly been apart, despite being residents of two countries on opposite sides of the world. We’ve had a lot of adventures and done a lot of crazy things – and we always trust to fate, or to Serendipity, to get us where we’re meant to be. We were married last year in an English castle, with guests from seven different countries helping us celebrate. I was a bit scared of marriage, at first. But like with anything else, sometimes you’ve just got to go for it. lovely story tony. please write some more. Thanks Kathy! Cheers for stopping by. Glad you enjoyed it! Absolutely! Opportunities seem to seek you out when you travel – or else you get desperate and go looking for them! Either way, it’s one of the best things about being a vagabond, I find – crazy sh*t just has a tendancy to happen – and both of our books are proof of that! Voted Up for ya .. 'natch. Thanks Tony, I hope I win too haha! South America eh, awesome. Yeah, real jobs … poo! Given I can’t do any real jobs (ok, any jobs at all), my only chance is winning the travel so fingers crossed! Bugger Tony wish you had told me about that contest, my serendipity almost rivals yours: year long travel, screwed over by a volunteer group in Sri Lanka, decided to just toss the flight there and go to Nepal, end up meeting my now fiance and am presently waiting for my skype interview to work on the ship with him….. You got to share the love!!! BTW might need to get the name of that clinic as we are hopefully going to that island to work with a friend at a dive lodge in November and would enjoy some volunteering. Sorry, it never occurred to me! But if you write to the lovely folks at Technomadia.com, they’re always on the look-out for stories of serendipity – it’s like the central prevailing theme of their travel philosophy (as it is with me, although I don’t talk about it much for fear of being called a hippie!). It’s a great and really popular blog they have, so always cool to get a shout out from them. What a fairytale life, that is lovely! I’ve been to Australia but not Perth since I used to live in New Zealand. Did you ever get over there? We nearly went to live full-time in NZ, but ended up in Perth as all Krist’as family are here. My sister didn’t have any such qualms, and is emigrating to NZ as we speak – I think she’s in Wanaka right now! Aye, on both fronts! I’ll be there at some point, and she’ll pretty much ALWAYS be there from now on – as soon as her visa is sorted out, anyway! I must admit to being a tad jealous. I love NZ! Great blog post Tony! Such a sweet story, just like with me and my wife. Keep on writing! Thanks Gerald! You do commercial diving, eh? I like the sound of that. I’ve thought about it a few times, being a keen sports diver, but the training is staggeringly expensive!